Located in the Ports d'Asnières area, the Novotel Paris 17 hotel is close to the Arc de Triomphe and Sacré Coeur! With views of the Eiffel Tower from an Executive Room, you will be ideally located for exploring the streets of Montmartre or shopping! Welcome to Novotel Paris 17, located in the 17th arrondissement only a few steps away from the So Ouest shopping centre. This sleek hotel offers spacious guest rooms and Executive rooms with views of the Eiffel Tower. But above all, this is a place where you immediately feel at home. Take time out to unwind in the 24-hour gym while the kids have fun in the play areas. With a loved one, as a family or solo, indulge in delicious moments in our bar-restaurant. Visitors appreciate this Parisian hotel's eight meeting rooms, private car park and, most of all, ideal location. With direct access to the ring road, proximity to public transportation and a Vélib' bike rental station nearby, Novotel Paris 17 makes it so easy to explore the city. Shopping in well-known department stores, visiting the Arc de Triomphe and the Champs-Élysées, business meetings at La Défense or the Palais des Congrès... whatever the reason for your visit, we promise you a warm welcome. Paris, the capital of France, gastronomy, fashion, festivals, culture, romance and more. 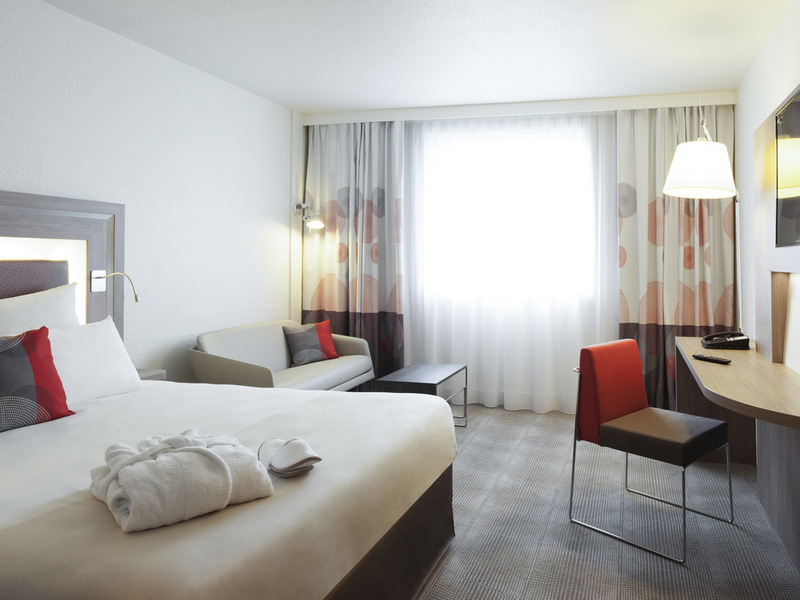 Make the most of your Parisian experience by staying at the Novotel Paris 17 hotel. With a contemporary and completely modular design, the spacious Novotel room is a real living space and can be adapted to suit all requirements. Our 140 rooms have been completely renovated and include a flat-screen TV and air conditioning, minibar with free bottle of water and free WIFI. Choose an Executive Room and enjoy the VIP treatment: robes, slippers, free minibar, Nespresso coffee machine and views of the Eiffel Tower. In need of a tasty snack? Our chef whips up fresh, colorful, seasonal dishes at the Novotel Café! You can also treat yourself to our selection of wines, or order from the menu in the bar or your room at any time. Whether you are attending a business meeting or enjoying a drink with friends, the Novotel Paris 17 bar is the perfect spot to share a pleasant moment. Why not take a few moments to unwind in our cozy, inviting and stylish space. Comfortable room, nice breakfast, good location. Check in staff reasonably helpful and knowledgeable. Dear guest, Thank you for taking the time to share your comments. Our rates change according to several factors: - periods (such as periods of school holidays or exhibitions in Paris for example) - the day you wish to come (a Monday evening will often be cheaper than a Tuesday) - the date you book (the sooner you book, the more advantageous offers). In spite of that, I hope to continue to count you among our Novotel customers. We hope to see you soon in our hotel! The stay was very comfortable . Our mail was responded promptly for an early check-in as our we arrived in Paris a bit early and in fact the room was also prepared quickly by the time we were at reception. All the facilities were good. One of the main features that keeps me happy as a guest in a hotel is its cleanliness and Novotel 17 was just that! Upon arrival we were greeted by a very friendly and helpful front desk clerk, Dustin. He took the time to accommodate me and my family in any way he could. If I had the luxury to holiday in Paris again, I would love to stay at Novotel again, as well! I have stayed at this hotel multiple times over the last 4 years. Good and clean hotel. Although the hotel itself is nice, I was really disappointed with the service I received when checking in. As I was travelling for business, the room was purchased for me via my travel agency. When I tried to check in, the person who greeted me explained that I need the same credit card that was used to pay for the room. I understand the policy, but the person who dealt with me was very rude, didn't do anything to help my situation and I felt he took pleasure in turning me away. I also think he was quite smug - at one point he went to the back room only to print the terms and conditions to make his point, showed them to me and walked away. By far the worst service I've received in a long time. A colleague of mine arrived at the hotel on Thursday. He was on a business trip, and the company travel agency had booked the room, as they do for everyone. My colleague was informed he needed the credit card used to make the booking - impossible for the above reasons. The male receptionist was absolutely unhelpful and unwilling to assist my colleague in accessing his room. He seemed not to care whether my colleague stayed in the hotel or not. Eventually the problem was fixed but not before my colleague was made to feel unwanted and unintelligent for failing to provide a travel agency credit card. We've used this agency to stay in hotels all over the world and have never encountered such poor, unhelpful service when staying in a hotel. My colleague's poor experience aside, the rest was fine. Someone entered my room in the middle of night. Someone entered my room in the middle of night. It made me scare and couldn't sleep for next two days. Very nice place for business trip. It is a quiet place to stay. The actual hotel was not very accomodating, it was meant to be a 4* hotel but looked very outdated. It was more expensive then it worth, it was clean. I would expect alot more from a novotel hotel, i was quite disappointed. There should be more staff and needs to look more modern from the inside. I wouldn’t pay for this hotel again, few more pounds you can get a better hotel. Dear A. Z., We thank you for taking the time to share your opinion. While we would have preferred your experience to be more enjoyable, your feedback and impressions are very important to us as they help us improve our services on a daily basis. Nevertheless we are surprised because our hotel has had major renovations 4 years ago. The satisfaction of our customers is our priority, but apparently we did not succeed this time. If you give us the opportunity to regain your trust, we will be happy to offer you the best that our customers enjoy every day. Please accept, Madam, Sir, our best regards. Very nice, comfortable and friendly.